Note: place cursor on graphics for citation and further information. The sound clip is shown by the word being in underlined bold red text. Click the word and your installed MP3 player will start. Self-published, ISBN 9781463741754, paperback, 294 pages. This book has a long history - though not quite as long as the 100,000 years of singing it proposes to cover! I first heard about Victor Grauer's work back in 2005 when he wrote a very positive response to Fred McCormick's article on Cantometrics. Victor was one of the team which worked with Alan Lomax on his Cantometrics project back in the '60s. He went on to say 'I've recently become interested in Cantometrics again, after many years, thanks to certain new developments in genetic anthropology. Many things which had puzzled Lomax and myself about the distribution of musical styles worldwide are now making sense, thanks to the ability of these researchers to reconstruct some of mankind's earliest migrations from strands of DNA'. He also pointed me to a web blog where he had outlined some of the ideas he'd been developing. There I found some truly earth-shattering ideas emerging from his readings in the genetic anthropology literature. Collaborations with various genetic anthropology researchers came later and are still in progress. The blog ran for several years and prompted some requests for him to put the whole thing into book form. This he did, and began searching for a publisher. The very long and involved story of this search forms the preface of this book. Simply put, no matter how he presented the work, and no matter what type of publisher he approached, it seemed that a book like this - which is about music, history, anthropology, ethnomusicology and several other areas of study; and thus is not easily pigeonholed - appears to be unpublishable in today's world of books. So, in the end, he was forced to publish it himself. Given the fate of several large booksellers and publishers recently. this may not turn out to have been a bad decision. Music: Stylistic similarity shared by the three populations, western Pygmies, eastern Pygmies and Bushmen: delicate, extremely relaxed and fluid vocalizing, often highlighted with yodels; interlocking parts; a frequent tendency for one part to be completed by another part, with the effect of a melody tossed back and forth between two or more voices, a practice similar to what, in Medieval Europe, was called 'hocket' (or 'hiccup'); the extraordinarily well matched and fluent blending of the voices; intricate, precisely executed, polyrhythms; the predominance of meaningless vocables, usually open vowels, such as "oh" or "ah"; highly repetitive, but also varied, melodic structures, based on short motives (but with an underlying melodic phrase as an implied, but often unheard, basis); frequent imitation of parts, as in a canon or round; wide melodic leaps; a continuous flow of interwoven sound with no pauses. In most cases, singing is accompanied by complex, often polyrhythmic clapping. The music is collective; it is an expression of a group consciousness, which appears also to be the case with the culture generally, where important decisions are made collectively. Everyone participates; music making is an occasion for all present to join in. While certain rituals are limited to males or females only, there are no musical specialists. All participants are expected to add their voices to the musical fabric. Culture: Having an 'egalitarian' sensibility, coupled with individual autonomy; being fiercely egalitarian and independent, with no chief in the sense of a person commanding ultimate authority; valuing sharing, cooperation, and autonomy and intergenerational equality; lacking negation and violence; male-female relations are extremely egalitarian by cross-cultural standards; physical violence in general is infrequent. In all, probably as egalitarian as human societies get. Alan Lomax, using cantometrics, and many other ethnomusicologists using other methods, attested to the numerous similarities in the Bushman and Pygmy singing, and proposed theories as to why this should be so - but none could be proved. Not, that is, until the advent of cheap DNA analysis ... This has shown that both Bushmen and Pygmies are probably the oldest peoples on the planet. Then there's Grauer's theory on 'cultural stasis' - which rather flies in the face of 'well-respected' attitudes regarding the pervasiveness of change - which states that in simple, discrete cultural groups, the basic cultural practices do not change significantly over time unless the culture has been overwhelmed by some catastrophic event which has dramatically changed the whole situation in which the culture originally existed. This seems not to have been the case with either the Bushmen or the Pygmies; both having gradually moved into the desert or the jungle in response to the 'Bantu expansion', beginning some 4,000 years ago. And both peoples have very similar social and cultural structures which are quite unlike those of other peoples in Africa. Taken together, the DNA profiling and the 'cultural stasis' theory can be interpreted to mean that the Bushmen and Pygmies are the direct successors of the original ancestors of the human race, and that their music may well be the music of those ancestors. Bloody hell! hunting and gathering. Honey is an especially prized food. Use of the Honeyguide bird to locate the hives. division into small bands; nomadism. most likely flexible and loosely applied; possibly universal or even nonexistent. unknown. Possibly tropical forest or East African savannah. wooden spears; very possibly bows and arrows with wood or bone arrow tips; very possibly poison-tipped spears and arrows, but more evidence is needed. wooden, bone and stone implements (the last based on archaeological evidence - metal tools and weapons are currently in use). unknown, but probably some type of tone language. Pygmy/Bushman vocal style (see Chapter One); certain songs originating in dreams or trance; musical bow; hocketing pipe ensembles; few other instruments; no drums. possibly proto-shamanistic. Supernatural healing, trance, possession, contact with spirits via dreams, initiation rituals, funerary rituals, strong orientation toward ancestors. extraction of harmful objects by suction. strong emphasis placed on egalitarianism, cooperation, non-violence, conflict avoidance, individualism, sharing of vital resources. relative equality, based on male-female complementarity. Women and men have different, though sometimes interchangeable, roles. mostly cooperative, unaggressive and peaceful; however, sometimes contentious, sexist and/or violent in spite of relative gender equality and strong social sanctions against violent behavior. nonexistent. Also Headhunting, Cannibalism, Blood feuds, Raiding, Slavery, Prostitution, Sexual mutilation: all nonexistent. By the time we've got to this point, we're at the end of Chapter 6, page 82 ... and we move on to the area where Victor Grauer's interest in cantometrics and genetic anthropology coincide, and begin to help each other out - the Out of Africa migration. According to the Out of Africa model of human history, a relatively small group of Homo Sapiens migrated across the Red Sea, possibly at its southernmost point, the Bab el-Mandeb (Gate of Tears), some 80,000 to 60,000 years ago. There would have been nothing special about this group whatsoever. They were not the first to have crossed the Red Sea to Asia - relics of a much earlier migration have been found in Israel, but that lineage seems to have died out. And there may well have been other groups to have made a similar crossing both before and after them, though none of these other lineages seems to have survived either. As far as they were concerned the perilous journey across the bay to a shore they could barely make out on the horizon might not have been much different from other such crossings made over wide rivers as they journeyed from place to place - they were, in all likelihood, nomads. It's possible they crossed the Red Sea to escape some other people seeking to destroy or enslave them. Or maybe they simply hoped to find better opportunities for hunting, fishing, collecting shellfish and other nutrients. Everyone whose ancestors lived outside of Africa is descended from this one small group, which I'll be calling HMP, or the Hypothetical Migrant Population. I�ll refer to their culture as HMC, or the Hypothetical Migrant Culture. On his website, The Journey of Mankind, Stephen Oppenheimer traces the Out of Africa route in red (see picture, right), starting roughly 85,000 years ago, from the horn of Africa across the Red Sea, northeast along the coast of the Arabian desert, then southeast along the coast of India, and from there following the coastline of the Indian Ocean eastward all the way through Indonesia, at that time part of the Asian mainland, and then northward, up the Pacific coast to what is now southern China. All of this can be 'proved', or suggested, by DNA and cantometrical evidence gleaned from indigenous peoples still living along the same pathway. However, there is a big gap in the picture. What is known as a 'bottleneck' appears. A catastrophic disaster centered somewhere in South Asia may well have produced one or more major population bottlenecks, which could have had important consequences for the future of the human race. Stephen Oppenheimer has suggested that the explosion of Mount Toba in Sumatra, some 74,000 years ago may have been the cause of the bottleneck. 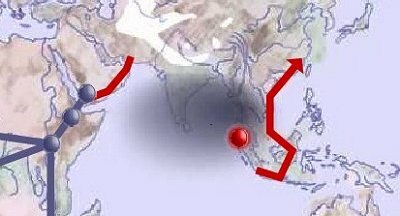 The grey puff you see on the picture, right, is the fallout from the explosion of Mount Toba � the red dot is where Toba is located, in northwest Sumatra. The result was a six year 'volcanic winter' causing a 1,000 year ice age. Volcanic ash from the eruption covered India and Pakistan and there would also have been huge tsunamis - devastating to the Out of Africa migration, which, as we've seen, was largely coastal in nature. But the most important effect of the explosion was upon the humans who, somehow, survived the event. Conditions must have been nearly impossible for generations; and it's not difficult to see how some of the original core values, inherited from the Hypothetical Migrant Culture, might be lost. Egalitarian values might go by the board in a situation where the strong can only survive at the expense of the weak. And the weak survive only if protected by someone stronger - and more aggressive. Once such a situation is established, it's very easy to see how it could become a self-perpetuating tradition. And genetically, there's the matter of the favoring, if only by chance, of certain genotypes and phenotypes (so called 'racial' characteristics). All societies contain a certain amount of morphological variation, but when almost everyone is struck down by a disaster, then the genetic and morphological characteristics of the survivors become the new norm, which could be quite different from the old one. It is suggested that this could be the cause of the many and varied races of mankind, spread throughout the world, which exhibit few of the cultural elements of the Hypothetical Migrant Culture, and of their genetic codes. Much of the rest of the book, whilst still very interesting, falls rather outside the scope of this review (in that it doesn't specifically relate to music). But there is one section dealing with the development of music and language. Put extremely simply: a single musical note is just a sound; it has no meaning in musical terms. Two different notes, if they are harmonically related, might just be considered as the simplest form of 'music' - but three harmonically related notes can be truly seen as real music, because they can be perceived as forming part of a system and can be formed into a series of different phrases. The important aspect here is the system - which is almost universally the harmonic system - which gives the notes within it significance, and enables them to create music. On the basis of the above, it's not difficult to see how the development of a system of rationally related pitches could have led to the development of a language of sorts, based exclusively on tonal relations. Each individual tone will now be heard in terms of the tonal structure embodied in the entire set, and will at the same time be in a position to function as a signifier. Could this have been how speech emerged, as a language of pure tones? If the earliest 'language' consisted essentially of discrete pitches, then we can see how, for early humans, the development of musical awareness, as part and parcel of linguistic awareness, would have had a powerful adaptational advantage. At a certain point this proto-language or 'musilanguage' would have diverged into two independent branches - one leading directly to purely musical interactions, the other leading directly to the development of tone language, as the use of tonal phonemes would have persisted even after non-tonal elements were added. Victor Grauer began the book by quoting a single question, broken down into three fundamental parts, asked by the great French painter Paul Gauguin in an obscure corner of his final masterpiece: D'o� venons-nous? / Qui sommes-nous? / O� allons-nous? ; Where do we come from? Who are we? Where are we going? Grauer rephrases this as: Who were our ancestors, what were they like, what part of their legacy has survived, and what lessons can we derive therefrom? In the final chapters he attempts some answers based on what we've learned of our ancestors in the course of a couple of decades of cultural and genetic anthropology. The answers are illuminating - but far too long to reproduce here ... read the book! The book ends with an impassioned attack on the notion that humankind is somehow genetically predisposed to violence, aggression and exploitation, which is a joy to read - particularly in today's social and economic climate. 'Incentives produce advancement' and 'greed is good' are roundly condemned - with the intellectual back-up of all the evidence Grauer has presented in the book ... and by the results of such notions we can all too easily recognise in the world around us today. 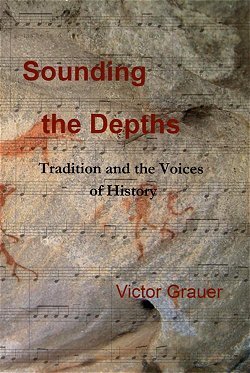 Sounding the Depths is well writen and logically presented; an enjoyable and interesting read, principally because it contains so many exciting ideas pertaining to the human condition, a good number of which relate to music in some way. The extent to which it is ultimately convincing rather depends upon the extent to which you're prepared to suspend your disbelief whilst reading it. I certainly had no problems there, and have become an enthusiast ... but that's just me; you'll have to decide for yourself. You may consider it overly speculative, but I think that the speculation is justified by the interest of the questions raised. The only parts of the book which I found difficult to understand were those dealing with the technicalities of the genetic markers - lots of terms whose meanings I was unsure of (a glossary might have been helpful) - but, as with much modern science, I felt it possible to grasp the meaning of the arguments without understanding the details ... I can use a computer without knowing exactly how and why it works! Because the arguments presented in the book require many recorded musical examples (85 sound clips and 13 video clips), Victor Grauer has created a page for them in his blog at: http://soundingthedepths.blogspot.com/ Similarly, some of the 78 charts and tables he refers to (which would require permissions to reproduce in a physical book) are also located there. It's possible to read the entire book there, with all the recorded musical examples and tables readily clickable, and this is probably the easiest way to do it. But a lot of people like a physical book to hold and own ... and it was the book I was sent to review. Whatever - you can read the whole thing on the above website, or buy this extraordinary book from CreateSpace.com or from Amazon.com for $12.96 - around �10. Highly recommended.